So someone is getting married in the office; brilliant! Except for one thing, trying to find a card that isn't the same as everyone elses, that errs on the side of professional rather than too familiar and one that doesn't complete with cheesy message. This is exactly what ecards were invented for. They are a photographic image sent via email that sum up everything with or without the addition of a message on the front. The result is a timeless reminder of a very special time in a brides life. They are also perfect for sending to a person you only know through work and you don't want to go down the cheesy, familiar route. 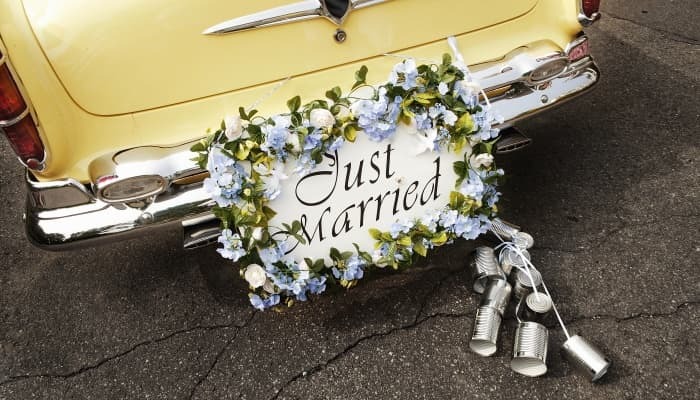 The beautiful Wedding Cans corporate ecards shows the traditional scene of a sign on the bag of a vintage car with various tin cans tied to it. You can actually imagine the noise they will make clanking along the road as the happy couple drive off to start their new lives as husband and wife. As far as wedding ecards go it is one of the best and as far as sending your own personal greeting to a work mate before their wedding day is it absolutely unbeatable. Does your business still live in the dark ages by sending paper greeting cards? If so then we would love you to consider our amazing e Christmas cards for business.